Palmarosa oil calms the mind, yet has an uplifting effect, while clearing muddled thinking. It is used to counter physical and nervous exhaustion, stress-related problems and nervousness. 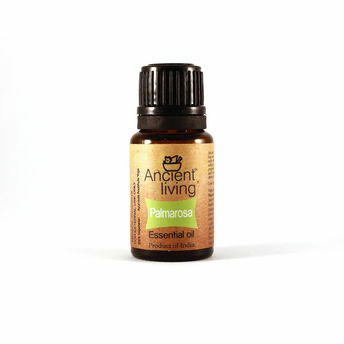 Palmarosa has also been used in traditional Indian medicine to treat fevers, infectious diseases, rheumatism and nerve pain. Palmarosa has excellent skincare properties and is also beneficial for nervous tension and stress-related complaints. Antiseptic, bactericidal, cicatrizant, digestive, febrifuge, hydrating, stimulant (digestive, circulatory), and tonic. Relieves fatigue, nervousness, exhaustion and stress, while having an uplifting effect on the mind and clearing muddled thoughts. Helps calm the mind and has an uplifting effect. Beneficial for stress, anxiety and nervous exhaustion and can also help if you are feeling, confused, lonely, vulnerable and insecure. Palmarosa oil moisturizes the skin, while balancing the hydration levels and stimulating cell regeneration. Balances production of sebum, to keep the skin supple and elastic and is valuable for use with acne, dermatitis, preventing scarring, rejuvenating and regenerating. It can also help fight infection in wounds and prevent scarring.